Scotland's children's commissioner has condemned ScotRail for installing a sound device to deter young people from gathering at a train station in South Lanarkshire. Bruce Adamson said the device at Hamilton Central Station was a breach of children's rights. ScotRail said it had taken the step as a result of anti-social behaviour. It follows protests by the RMT union, who said staff were in fear after a "surge in violence" at the station. The electronic device, often referred to as a "mosquito", is used to deter loitering by emitting sound at high frequencies that is mostly heard by younger people. It was installed at Hamilton Central a fortnight ago after a protest by the rail union, the RMT, who said their members were the victims of anti-social behaviour at the station. In a leaflet handed out to passengers in June, the union said: "Workers at this railway station are under direct fear of violence and other variations of assault whilst just turning up for work to serve you." However, Children's Commissioner Mr Adamson said he would be raising the issue directly with ScotRail. He added: "International human rights bodies, and my office, have long called for these devices to be banned. "The use of such devices is a breach of children's rights to go about their lives free from discrimination in a healthy and safe way when they use public transport, visit shops or meet their friends. "These devices are a disproportionate and degrading approach that acts without discrimination, causing discomfort to any children and young people who encounter them." Amy Lee Fraioli, chair of the Scottish Youth Parliament, said she had first-hand experience of the device at Hamilton. She told BBC Radio Scotland's Kaye Adams programme: "I discovered the device the other night when I was actually waiting on a train at Hamilton Station, which had been delayed. "I was waiting there for over 20 minutes and the noise was absolutely torturous. It makes young people feel as if their presence is nothing other than a nuisance and that's obviously not the case. "It's so uncomfortable. It's really high pitched. It starts to give you a sore head when you're standing there. "It got to the point that I was ready to leave the train station, when the train came. It was unbearable." She added: "A lot of young people pass through that station to get to work and university or school and they'll be affected by this and they're not doing anything wrong at all apart from going about their daily business, which is their right." ScotRail said there was "minimal" use of the device and that it was controlled by a small number of staff. 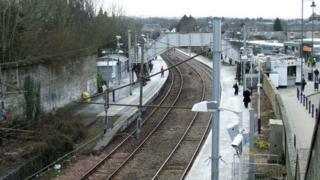 A similar device has also been installed at Helensburgh Station. A spokesman added: "The safety of our staff and customers is always our number one priority. "We are committed to working with all our partners to make the station as safe as it can be. "As part of this multi-agency approach we have introduced a suite of measures to tackle anti-social behaviour and since these have been put in place there has been a significant reduction in incidents in and around the station."